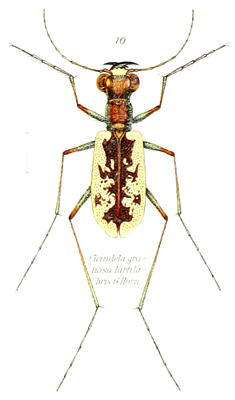 This is a third instar larvae of Cicindela albissima – the Coral Pink Sand Dunes Tiger Beetle. I found the larvae to be virtually unapproachable during the day, but at night, with a little patience, I could get right up to their burrows. The head and pronotal coloration of the larvae is quite vivid – one of the most colorful that I’ve seen. I photographed this individual and many more while I was doing some fieldwork back in 2010. I’ll post a best of from that trip in the coming month, if time permits. Back on a late July day I was heading back from a field survey in Maryland’s eastern shore and decided to take a brief detour. I was not far away from a site where I had photographed Cicindela abdominalis back in 2008; however, I was not satisfied with the few shots I had taken and now wanted to take the opportunity to get some better shots. The location in question, a sandy powerline access road adjacent to a park, was about half an hour away and by the time I arrived at the site the sun was sinking low in the sky. I was worried the beetles would not be active, but my concern was short lived as I spotted my first beetle within minutes of walking around the site. This individual was wary, taking flight as I slowly attempted to move closer and I watched as the beetle alit in a sandy patch several feet away. Moving even slower I soon managed to get a shot of the beetle, though the posture of the beetle and the framing of the shot were not quite what I had hoped for. The beetle seemed to acclimate to my intrusion and darted sideways, out of the camera’s field of view, grabbing a minute ant from the sand and a voraciously masticating it with its powerful jaws. Unfortunately as I repositioned the shot, my flash diffuser brushed against a tall blade of grass and this movement caused the beetle to again take flight. During my brief search for another subject, I noticed several adult C. punctulata also darting about the sandy patches and taking flight as I approached. Before long I saw another distinctively small C. abdominalis. This time I approach slowly and using the Live view function of my Canon SLR managed a far better shot while holding the camera out a short distance from me. I continued to attempt shots of a couple more beetles, but none of the results were quite as good. I did manage to get a clear shot of the maculations and characteristically red abdomen of one individual as it turned away from my lens. By the time I finished taking shots of abdominalis, the sun was dipping behind the trees and I had to begrudgingly pack up my gear and continue down the road back to Virginia. For more information on this species check out the species page on BugGuide. Here is an unusual and rather uncommon tiger beetle – Cicindela ancocisconensis – I came across a number of these beetles when I was out at Breaks Interstate park. I spent an near idyllic afternoon there observing and photographing individuals a couple of summers ago. This 4600 acre park which sits on the Virginia/Kentucky border is home to the aptly named “Grand Canyon of the South,” a five mile long, 1650 foot deep gorge through which the Russell Fork river runs. 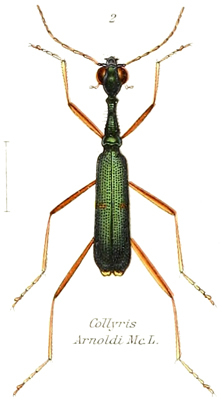 In most of their range – mountain river in the eastern U.S. and Canada – Cicindela ancocisconensis is rather uncommon if not gone all together, but here at Breaks (the habitat has been protected since 1954) there were moderate to even high numbers of these beetles on the shore and rocks along the Russell Fork river. One interesting facet of this species is its dark metallic green to deep purple underside, which starkly contrasts with its fairly normal Cicindela repanda-like appearance, and distinctive tri-toothed labrum. I wanted to capture the amazing moment when a tiger beetle larva captures prey so I took my Canon 7D, set it to 720p, 60 fps in video mode, and waited for the larva to come to the burrow mouth. Once the larva was at the ready I dropped a small prey item, in this case a Red Flour beetle (larva and adult), and dropped it as close to the edge of the tube in which the larva was set up; this process was repeated twice. The strike at the prey was so fast only when the video was played back frame-by-frame was I able to see the process. For the video of each prey items I selected one frame from before the larva struck and one at the moment at the moment of the strike itself. 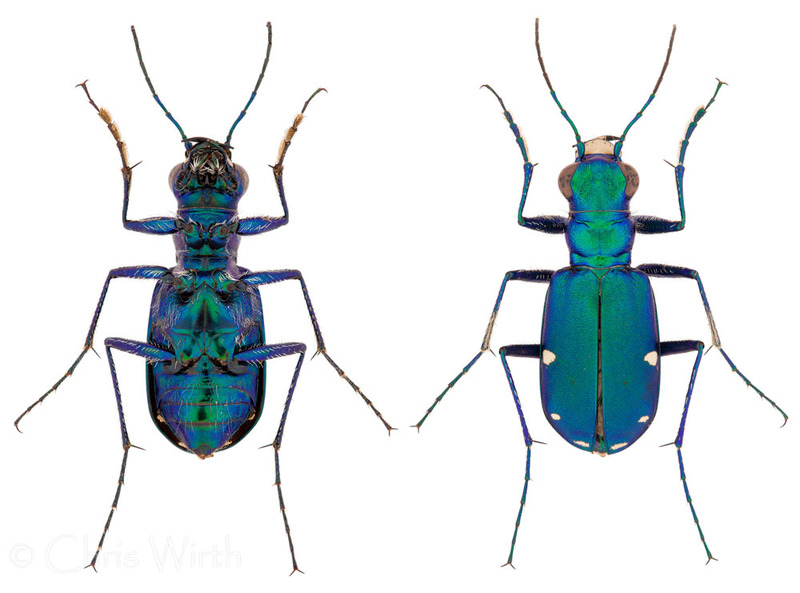 This beauty is the common, but ever intriguing Cicindela sexguttata. 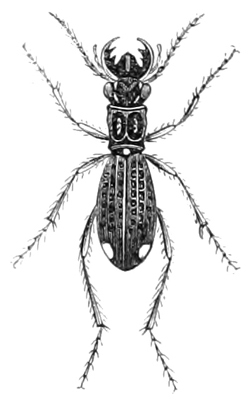 This species is found mainly from April to July (1) on dirt trail and fallen logs throughout the eastern US. This little gem is the larva of Cicindela albissima, formerly C. limbata albissima – recent research showed that it is a separate species. I photographed these individuals at Coral Pink Sand Dunes State Park, outside of Kanab, UT. This species is found only in the state park and adjoining BLM lands; with the bulk of the population found within a 300m x 2.7 km protected area of state park. This year marks the 10th anniversary of the conservation agreement between BLM, USFWS, Utah State Parks and Kane County which established the protected area. Before the agreement, these beetles were facing imminent habitat loss from off-road vehicle traffic, which de-stabilized the dunes and destroyed vegetation.